Alex Deane is a Rotary Scholar and World Universities Debating Champion, and is a non-practising barrister. Alex was formerly Chief of Staff to David Cameron and he served as an adviser for the Australian Liberal Party’s re-election campaign under John Howard. He was the founding Director of Big Brother Watch. Today he is an elected Common Councilman in the City of London Corporation, serving on the main decision-making body in the Square Mile, the Policy and Resources. He is also currently Managing Director in the Strategic Communications segment at FTI Consulting. Based in London he serves as a member of FTI's Public Affairs and EMEA Corporate Communications practices. Until recently, Alex was Head of Public Affairs at Weber Shandwick. He often appears in the broadcast and print media as a political commentator. Swiss national Richard Olsen has combined academic research with hands on experience in financial markets. He founded Olsen & Associates in 1985, which developed and marketed a real time information system with forecasts and trading recommendations for financial markets, co-founder of OANDA, a successful internet market maker, and Olsen Ltd, a hedge fund. Richard is a pioneer of high frequency finance and has co- authored the book Introduction to High Frequency Finance, published at Academic Press in 2001. Together with a team of researchers he has recently discovered 12 new scaling laws of the foreign exchange markets continuing work on scaling laws that was first started in 1989. He is visiting professor at the Centre for Computational Finance and Economic Agents at the University of Essex. Norman Lewis is recognised worldwide as an expert on future trends and user behaviours with regard to technology innovation and adoption. He has spoken on these topics at events all over the world. Norman is currently a Director at PwC responsible for running their crowd sourced innovation programme. He is a co-author of Big Potatoes: the London manifesto for innovation. Prior to joining PwC he was Chief Innovation Officer and Partner at Open-Knowledge – a global consultancy on enterprise social software. He was the Chief Strategy Officer of Wireless Grids Corporation, USA, and the Director of Technology Research for Orange UK, formerly the Home Division of France Telecom. He was also previously an Executive Board member of the MIT Communications Futures Programme and a former chairman of the ITU TELECOM Forum Programme Committee. David has a core organisational role in producing both the Battle of Ideas weekend and convenes the festival’s 2 month long series of national satellite events. Outside of the festival he produces, chairs and speaks at events for schools, universities, festivals and business on a broad range of topics. He also contributes to national broadcast and print media on issues relating to politics, the regulation of lifestyle, the arts and popular culture. David has extensive experience in public affairs and communications, having worked with organisations including Libertas, the British Pregnancy Advisory Service and DACS. He has a MA in Creative Writing from the University of Exeter. These are said to be unprecedentedly uncertain times for business, but one area where there seems to be much certainty is that businesses need to do more than be profitable providers of goods and services: they must also do the ‘responsible’ thing, do the ‘right’ thing, for the rest of society. It has become received wisdom that in order to restore trust, business needs to re-orientate its culture and values. Yet is maximising profit really at odds with social good? Could the corporate social responsibility (CSR) agenda conflict with the social benefits of profit-making business? How important is trust for profitability? In a world in which government is trusted even less than business, who should decide what ‘the right thing’ means? Even the widespread adoption of CSR policies seems to do little to assuage concerns. To some people, promoting your ‘ethical’ CSR credentials can reek of hypocrisy. Sincere CSR projects can be dismissed as ‘greenwash’. When there is so little trust, can big companies ever satisfy their critics that they are doing enough? But perhaps we should not expect businesses to ‘do good’. The urge to be socially responsible through initiatives beyond the central, profit-making purpose of a company may be missing the point about what really constitutes ‘doing the right thing’. As Adam Smith wrote in The Wealth of Nations almost 250 years ago: ‘It is not from the benevolence of the butcher, the brewer, or the baker that we expect our dinner, but from their regard to their own interest.’ In turn, the drive to create new wealth provides the resources for many other social goods, from healthcare and education to funding the arts and museums. 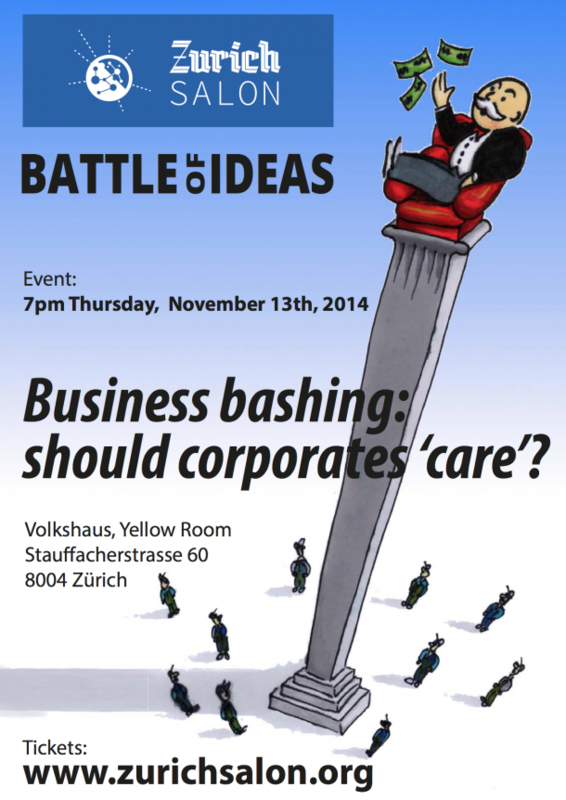 This debate on “corporate bashing” forms part of the Battle of Ideas (BoI) festival, initiated by the Institute of Ideas and supported by a wide range of partners including the Zurich Salon. The BoI consists of two days of high-level, thought-provoking, public debate organised by the Institute of Ideas at the Barbican in London, and a series of standalone satellite debates throughout autumn 2014 in Europe and the USA. It was Winston Churchill who famously said that "democracy was the worst form of government apart from all the others that had been tried." Much the same can be said for capitalism, particularly the form of capitalism that has been practiced over the past 20 years. It's not enough just to abide by the rules - companies are embedded in society and cannot ignore the moral dimension. Business would like nothing better than to be acultural, asocial and amoral. The problem is that today this is simply not possible – a situation that makes many business leaders uncomfortable. On 25 June, Nicholas Mulder and Michael Rogers of the King’s Review sat down with Professor David Runciman of the Department of Politics and International Studies at Cambridge to discuss his thoughts on Occupy Wall Street, his upcoming book The Confidence Trap, and the state of political philosophy. Yet rather than compete for the best, most effective supports for green energy, the biggest emitters in the world are rushing to the WTO to knock down each other’s windmills....Of course the richest and most powerful companies in the world will exploit the law to try to stamp out real and perceived threats and to lock in their ability to dig and drill wherever they wish in the world. If we want to succeed in the global race, we need to stop placing obstacles in the path of business....The foundations of a horizontal strategy must be sound: low taxes, a high skills base and deregulated, competitive markets. Disillusionment with democracy founded on mistrust of business and political elites has prompted a popular obsession with transparency. But the management of mistrust cannot remedy voters' loss of power and may spell the end for democratic reform. Does economic growth make you happy? The economist Richard Easterlin published a famous paper, “Does Economic Growth Improve the Human Lot?”. The answer, he concluded, after correlating per capita incomes and self-reported happiness levels across a number of countries is probably “no”. Phil Mullan examines how the decline of profitability and investment has caused corporations to lose faith in their social role, leading them to embrace the idea of corporate social responsibility - at the expense of democratic accountability. Five years after the low point of the Western financial crisis, we still see almost daily attacks on bankers’ bonuses and CEO pay levels. This idea that big payouts to business people are a key factor behind our economic troubles has become something of a ‘modern truth’; unfortunately it is one that obscures and stymies the much-needed deeper analysis and discussion of what’s really gone wrong with the Western economies. Business leaders’ acquiescence, and sometimes attachment, to their CSR obligations is getting in the way of business success. In fact, if CSR was only a campaign driven by a few anti-business, anti-growth groups, then the damage to business and society would be limited. Also, if CSR were just a PR gloss on the part of business - or ‘greenwash’, as some environmentalists deride it - then it would be relatively harmless....But it is precisely because businesses themselves have adopted the CSR agenda that it has dangerous ramifications. CSR is detrimental to business for two related reasons: it distracts from what businesses should be focused on; and it undermines proper business accountability.